Your simulation buddy. A simple program to simulate various pulsed EPR experiments for a system with S = 1/2 and I = 0 ... 9/2. System requirements: all versions of Windows higher than 3.1. Creation of this program was funded by NSF DBI-0139459. 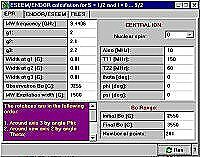 A data processing program designed primarily to process pulsed EPR experimental data, but many other types of data can also be worked with. Modification of this program to the current condition was funded by NSF DBI-0139459. A program that transfers data from a Bruker EPR spectrometer to PC over RS232 port. It is mostly of use with older spectrometers, like ESP-300, and also with older PCs that have RS232 (COM) ports. The above software is free to download and use for non-commercial purposes. 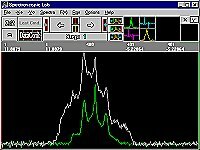 It is offered as-is, and neither the author (Andrei Astashkin) nor the EPR Facility of the University of Arizona accept any responsibility for the results of using this software. If you use this software to process your data, and this work results in a publication, an acknowledgment is certainly welcome. The graphics interface is optimized for the "Large fonts" display setting. Any comments and bug reports are also welcome. Please use the contact information listed in the column to the right. It always makes sense to check periodically for software updates because the new versions may have some improvements implemented and/or possible bugs removed.